Samford University professor Sharron Schlosser has earned the National League for Nursing’s prestigious Excellence in Leadership Award for NLN constituent leagues. The award recognizes an individual who has demonstrated excellence in leadership, service and commitment to the NLN’s mission to promote excellence in nursing education to build a strong and diverse nursing workforce in order to advance the nation’s health. According to Jane Martin, associate dean of graduate programs in Samford's Ida V. Moffett School of Nursing, Schlosser’s award comes as little surprise, as she is widely known for her leadership at the local, state and national levels. Schlosser has been a member of NLN since joining the Ida V. Moffett School of Nursing faculty in 1975. She was one of the first three nurses in Alabama to achieve the Certified Nurse Educator (CNE) designation from the NLN and she has spent her career pursuing her passion for preparing nurse educators of the future. Schlosser has served as a champion and voice for nursing education through her influence as an educator and leader in the profession. She has served as an officer for the local nursing honor society chapter, as an officer on several of the Alabama League for Nursing committees and as a delegate to the Alabama State Nurses convention. At the national level, she is a site visitor for the Commission on Collegiate Nursing Education (CCNE) where she serves as a team leader. She previously served as a NLN site visitor and as secretary for the Transcultural Nursing Society. Schlosser is a master teacher, mentor and leader in the field of nursing education. Her impact on Samford’s nursing programs is impressive. According to Martin, she was a leader in the move to online education in the graduate program, teaching both in the masters and doctoral programs. Schlosser is the first nursing faculty member to become a Certified On-Line Instructor (COI), a designation that further demonstrates her high level of achievement and dedication to teaching excellence. 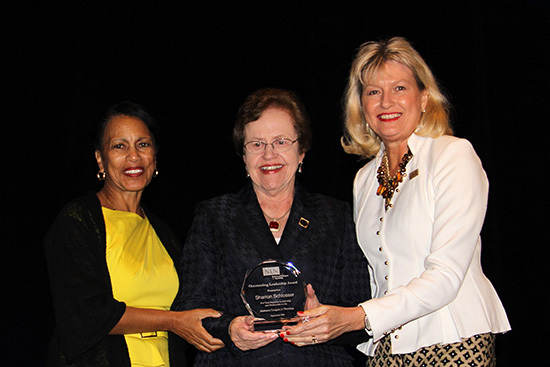 Schlosser was presented the NLN Excellence in Leadership Award at the annual NLN Summit in Phoenix, Arizona.